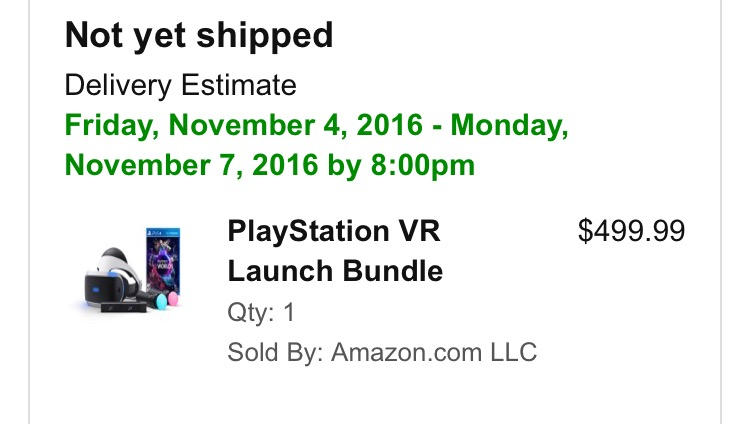 As you probably already know, PlayStation VR made its pre-order debut last week in the UK and sold-out in roughly 10 minutes on Amazons UK site. Today, pre-ordering became available for residents of the United States and Canada at 10:00 am eastern time. The UK version vs. US is slightly different. The UK debuted with a core bundle that did not include the PS Move or the current PS4 camera and ran for $400.00 USD. Today's pre-order was available for $500.00 USD and included the camera, move, PlayStation VR demo disc and PlayStation VR Worlds game disc. As you may expect, PSVR is already sold out. By my count, it was available on Amazon for around 7 minutes before the product sold-out online. Luckily I managed to finalize my order before it was too late. Now I know this may sound like bad news but, there is a silver lining. Next week, at 10:00 am eastern time (7:00 am pacific), the $400.00 core bundle will be available to pre-order again. That will be March 29th, to be clear. Its also been stated there are plans for more pre-orders sometime this Summer. The big question I have been getting is how much did the pre-order actually set me back today? The total cost (with free shipping) came to $536.22 and Amazon didn’t charge anything upfront. Some people questioned if the pre-order policy for games was the same with PSVR, so this is good news for those what want to secure a pre-order and have time to save up for it. Now I know there are a lot of people that are just shaking their heads at the thought of someone spending this much money on new technology for the gaming industry, I understand completely. $500.00 (USD) is a lot of money to drop into this market when we have seen so many devices fail over the years. Virtual Boy was a less than stellar experience for me, the Eye Toy camera, PS Move, even the PS4 camera has little support (until VR arrives that is). All I can really tell you is, I believe Virtual Reality is going to stick. Right out of the gate will not be perfect but, it will be no less amazing. I am totally fine with being a beta tester, as some have come to call us early adopters of technology. Of course it's us “beta testers” that are definitely taking a risk here. If it turns out PSVR is absolute crap, I’ll look back and think of all the other things I could have spent that money on. In the end, the day I open that box is going to offer me an overwhelming feeling that is worth a lot more to me than if it becomes a financial loss for nothing. Will you be joining in the virtual forefront?